I am just back from a very serene sunset in Rosbeg, Westport Quay. Just the lightest wind gently pushed the water against the shore, making a calming trickling sound with some muted chit chat noises from the Sheebeen Pub across the little bay. This is the way I love a summer's evening. I am back from my mini adventure on Clare Island where I wild camped near the lighthouse on the north shore. I managed to capture the lighthouse at sunset and again this morning at sunrise, as well as getting a few extra shots in from the cliffs around the corner. This one was yesterday's sunset. After an exhausting hike from the Harbour all the way up to the lighthouse, carrying about 18kg of photography and camping gear I finally found my idea camping spot. A room with a view. My tent set up with spectacular 360º views while being hidden away from civilisation. I prefer to pitch the tent somewhere hidden and away from most civilisation. The only creatures who noticed me were sheep, a few hares and birds nesting along the cliffs. Because of the current drought I didn't bring any cooking equipment (which would have made my backpack even heavier!) So I settled for small cold snacks, such as salami sticks, cheese, a pack of nuts and chocolate bars. On a hot day like this and with the perfect view it couldn't have been any better dinner. About an hour before sunset I made my way over the little hill towards the lighthouse. I knew already from where I wanted to capture the building, with the fence and the edges of the cliff leading the viewer towards the lighthouse and hopefully getting golden sidelight and some colour in the sky. And my prevision almost worked out exactly what I wanted. The sky towards the north unfortunately stayed a bit blend. So I packed my camera in fairly early as I didn't see any promise of better colour to come. Well, turning around 180º and getting back over the hill was enough to see a big display of pink clouds dancing over Knockmore Cliff. You can imaging how quickly my camera was back on the tripod. With the light fading and being exhausted after a full day of work in the gallery and a 5km hike I went into the tent early, ready for sunrise at 5am. My sunshine app "TPE" calculated the start of dawn (or civil start) at 4.15am and sunrise at 5.09am, which meant a good 5 hours sleep before I had to get up at 4 am. Thankfully I couldn't fall asleep at all and noticed an orange glow on the north-easterly horizon at 3am. I rushed to the same spot I stand on for sunset and witnessed one of the best dawns I have seen in years. All well before the predicted time of civil light. Panoramic view of Clare Island Lighthouse, with Mulranny, Clew Bay and Croagh Patrick in the background. The next ferry home was due to leave at 8am, which gave me a good two hours to leisurely walk back down to the harbour. With less food to carry in the backpack and only walking downhill made the walk seem quite fast and I arrived at the harbour at 6.45am. The hour long wait for the ferry to depart made me realise how tired I really was. Just when I walked back to the car the sky exploded. I still had the 10-stop ND Filter on the lens which allowed me to create a 2 minute exposure to get some movement in the clouds. In the background are Old Head to the left and Clare Island at the mouth of Clew Bay. This image was made yesterday from the Murrisk Barrier just after sunset. Yesterday's sunset, captured on my way home from the gallery when I passed through Rosbeg, Westport Quay. Yesterday I finally managed to get out of the house before darkness fell. So I decided to shoot the sunset at Silver Strand, as well as taking product photos for a client. Well, the product shots went okay, but the sunset was a no show with thick clouds coming in from the south west. I left Silver Strand with the last bit of golden light and couldn't resist to stop at the top of the hill to get this view on camera. Last Monday I dragged my body out of bed at an ungodly 7am - no, that's not early for most, but I am not an early riser! - and drove the 16km to Doolough for the sunrise. While at home in Louisburgh we had clear and calm conditions where I even had to defrost my car's windows, the weather in the Doolough valley was completely different. No frost, but a biting strong wind from the south directly into my face and the lens. I took a series of photos over a duration of about an hour and although I wasn't touching the tripod, the wind shook the camera wildly in between the shots. Luckily the individual images were shake free and sharp. So here's a photo of the dawn, about 30 minutes before sunrise. The purple hue is not from Photoshop, but reality. a selfie of a frozen me. Wind chill factor sub zero! Another shot from my photo outing in Emlagh last Tuesday. Today is one of the very few days when the sunset and the closing time of the gallery are working well together. 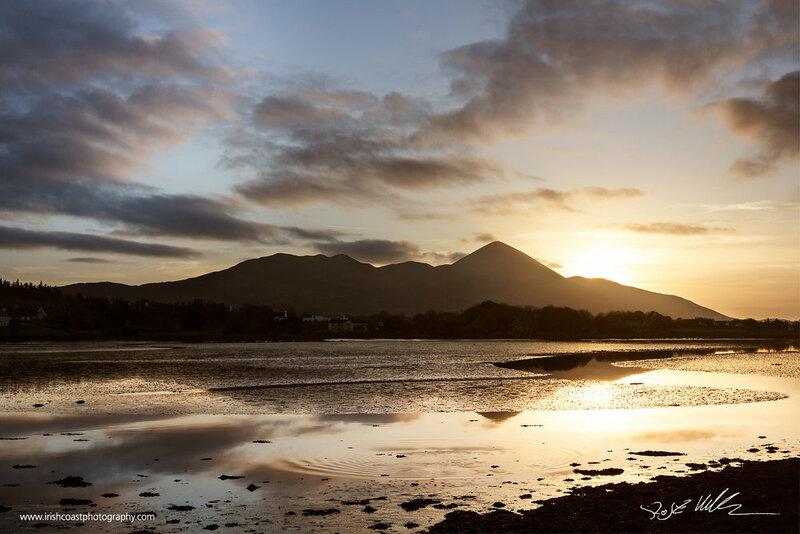 A short stroll away from the gallery to the water's edge at the Quay, where Croagh Patrick got backlit by the setting sun. Today's sunrise over Croagh Patrick, taken from Old Head at a slightly less ungodly hour. Still, I prefer sunsets when I am more awake and better functioning. Despite the gorgeous colours I could not find a nice composition and was running around the beach like a headless chicken. Westport Quay on a golden Autumn evening, a few days ago. last night's Aurora over Devlin, outside of Louisburgh, Co. Mayo. How to overcome the hurdle of waking up early for a sunrise? Don't go to bed in the first place and, instead, shoot stars and wait for the Aurora Borealis all night long (for nothing) and finish your photo trip with a sunrise over Aasleagh Falls and the Erriff River in Connemara. Unfortunately my expectations were a lot higher than the actual sunrise was, with a lot of mist and water spray on lower ground and little or no clouds in the sky. And adding to the insult I had less than 30 minutes to get ready for an 8 hour shift in the gallery. I am dead!! Need some sleep after being awake for over 36 hours straight. I am too old for this stuff!! Enjoy viewing the short videos of me making silly faces while being attacked by bloody midges. Well, during that time I was capturing the sunset over Doolough and was thinking "Is it worth being eaten alive just for this image??" It's been - and still is - a very busy summer season in the gallery, which has prevented me from going out and create new photos. Finally, yesterday I managed to bring the dog and the camera out for a long photo walk/drive along Mayo's north coast. We started at Broadhaven and ended up at Downpatrick Head where the setting sun put a nice glow onto Dún Briste. Although it was very windy with gusts of over 80km/h, which were able to shake not just my tripod but also myself quite a bit. Still, between those gusts I managed to get a few good shots. This is a panorama shot, stitched together from 9 vertical images, resulting in a very high resolution file, that can easily be printed in 3 x 1 meters without loosing any quality. Every now and then we do get to see that bright thing in the sky, especially when I have visitors over. What an opportunity to show off the local beaches, such as Silver Strand.